July 10, 2007 | Classic cars and classic rock made for great memories with .38 Special adding some rock 'n' roll attitude to the Cache Cruise-In. Every year in Logan, one can tell when July is arriving. Weather warms, firework stands pop up and classic cars come into view. The Cache Valley Cruise-In is a much anticipated event, as it is Utah's largest car show each year. 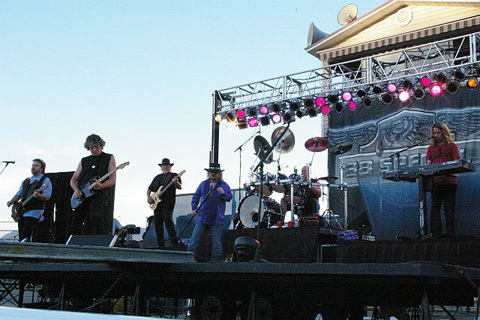 This year 38 Special was added to the list of events for this much anticipated weekend, making it a must-attend for many. On Friday, .38 Special brought a live assault of rock 'n' roll, with a touch of Southern style to the Cache County fairgrounds. 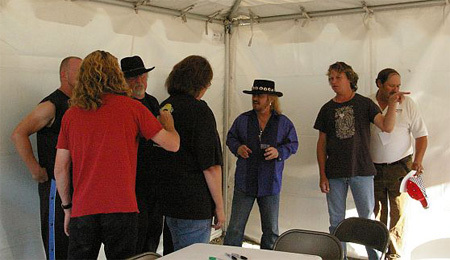 In a meet and greet before the show began, .38 Special signed autographs for fans and some of the awesome sponsors of the Cache Valley Cruise-In. The band members were friendly and very laid back -- conversing with all those lucky enough to meet the band and showing a side that spoke of a true thankfulness for their fans through the years. The show started with some of the organizers of the Cruise-In thanking sponsors and even giving a signed guitar away. And then the moment was upon us as the band sauntered onto stage. They came ready to rock some souls and so they did, with songs including Chain Lightning from their new album Drivetrain, which has a pure and devout rock 'n' roll sound. Added to that were many of their past hits, including Hold on Loosely and Rockin Into the Night and even a bit of country music thrown in for good measure, Help Somebody, off the new album that Donnie Van Zandt (lead singer of .38 Special) and his brother, Jonnie Van Zandt (lead singer of Lynard Skynard), collaborated on last year. Every member of .38 Special seemed to give everything to this astounding performance. They invited the audience to stand and move forward, which many did with no need for a second prompting. 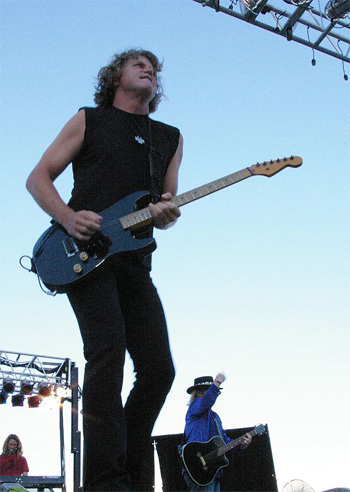 Don Barnes (singer, guitarist and more for .38 Special) poured his soul into the performance, giving everything he had to fans. Donnie Van Zandt (singer) incited the crowd into a near frenzy of tangible energy with his engaging performance that included constant movement and a freeness of spirit. Danny Chauncey (guitarist) aroused a reverence within the audience with his uninhibited and purely emotional ability to wield his guitar. Larry Junstrom (bass guitar) with his pristine playing and deft ability's brought wave after wave of tumultuous sound and beat. Bobby Capps' (keyboardist) captivating keyboard added to the soulful and emotional experience by pulling the audience within the realm of southern rock. Gary Moffatt (drummer) with his incrediable prowess for percussion, astounded the audience with a drum solo like no other. Ending the show with five encores, due to fans' unwillingness to let go of the feeling this band inspired . .38 Special delivered an visionary performance that will not be forgotten.